​"the land of steady habits"
THE STORY - Feeling trapped in the stifling, wealthy enclave of Westport, Connecticut, a man retires from his job in finance and leaves his wife in the hopes that it will renew his lust for life. He befriends a drug-addicted teen, sending him down a path of reckless, regrettable behaviour. His shameful actions cause him to question who he is as a father and, ultimately, who he is as a person. 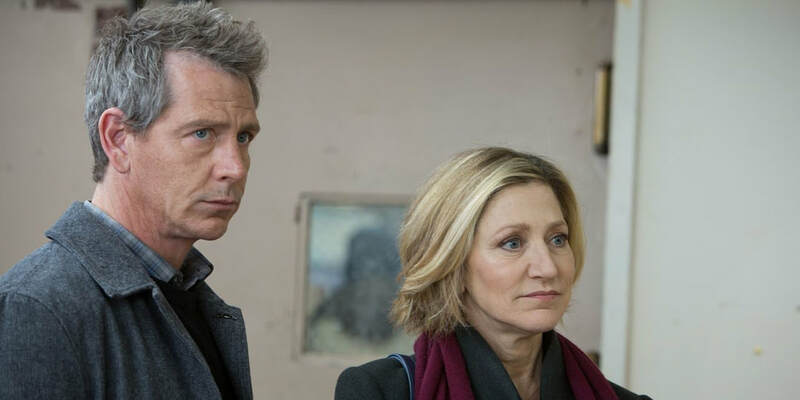 ​​​Nicole Holofcener’s Netflix drama “The Land Of Steady Habits” is aptly named. The world we’re dropped in is filled with melancholy characters who seem to be stuck in their own cycles, unable to break through into happiness. They’re falling apart, and struggling to put themselves back together again. “The Land Of Steady Habits” stars the wonderful Ben Mendelsohn as Anders Hill, a man embodying a mid-life crisis. He’s recently divorced and quit his comfortable job in finance. Anders is wholly discontent, unable to find satisfaction in his new apartment, in his one-night stands, or in anything really. He’s the sort of man who likely wanted to throw off the trappings of the life he’s lived for decades, but now that he’s free, he’s dissatisfied with his new freedom. We’ve seen this character time and time again, but Mendelsohn fills the role with authenticity and complexity. Anders’ dissatisfaction seems contagious. Or at least, everyone around Anders seems to stew in the same sort of dissatisfaction, even if they didn’t catch it from him. It’s a bit hard to sympathize with them all when every character makes disastrous decisions that only further their unhappiness. It’s the type of drama that makes you want to shout into the screen and tell them all to shape up. Anders’ son Preston (Thomas Mann) is a recovering alcoholic who is trying to pick up the pieces of his life and become a viable adult. His mother, and Anders’ ex-wife, Helene (Edie Falco) has moved on and is living with her boyfriend Donny (Bill Camp). The film struggles to find its footing early on. Unlike Holofcener’s other works, “The Land Of Steady Habits” doesn’t really counterbalance the sadness with much humor. Wit may be the missing piece here that might have separated this film from the many mid-life crisis tales we’ve seen before. It’s sadder than anything else, despite attempts at comedy. Still, the film paints an authentic picture of this struggling family. Each character is written with depth and empathy. Anders unexpectedly befriends Charlie, the addict son of their rich friends, at a Christmas party. Perhaps he connects with Charlie in a way that he always wanted to connect with his own son. The relationship, like everything Anders touches, has ruinous consequences. His own selfishness prevents him from being the adult that Charlie needs. Worse, Anders wants to make the right choices but doesn’t know how. The film keeps a steady pace that takes its time, just like the characters themselves. It’s in no rush to get where it’s going. As the story expands, showing Charlie, his parents, Helene and Donny, and Preston all struggling with their own inability to grow, the movie begins to get a little unwieldy. However, thanks to a remarkably understated performance from Mann, Preston fills us with hope. Maybe, just maybe, he’ll be the one to break out of these habits. He’s genuinely trying to make the right choices...until he doesn’t. Empathy is the film’s greatest strength, despite the frustrating inability for these adults to get their lives in order. This is a film about self-destruction in many forms. Anders is entitled and self-absorbed. Preston is an addict without ambition. Charlie is a teenager who never had to grow up. “The Land Of Steady Habits” never shows us what we want to see. They don’t break out of their cycles. They don’t fix themselves or truly confront their problems. It’s honest in that way, never giving us the easy out. But it also keeps the audience, like the characters, living in that frustration. This makes for a sad but effective film, with unfortunate characters who want to be whole again but have no clue how to get there.